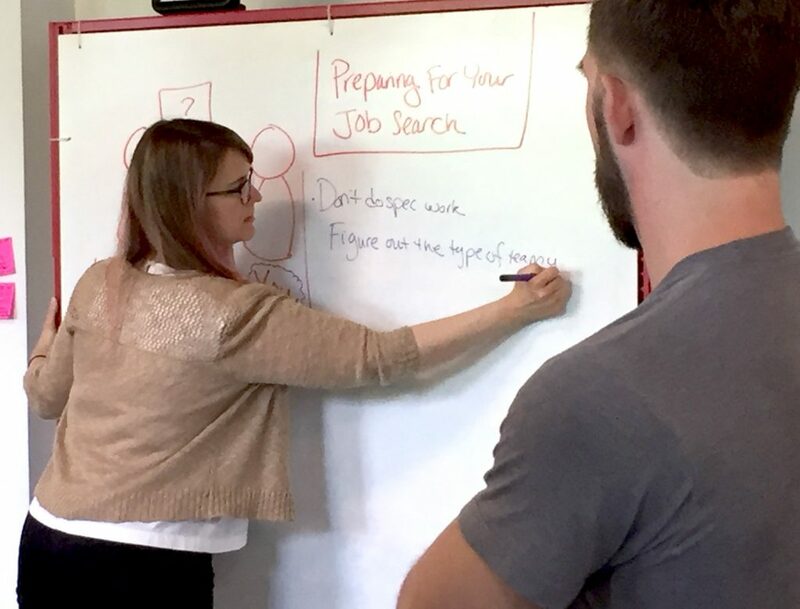 Me leading an exercise with my students during the Preparing for Your Job Search course at Center Centre. I know a UX designer who unexpectedly lost his job about a year ago. Despite having experience in the field, he had to do a ton of work to find a new job. While he was employed, he didn’t attend industry events. He neglected his web presence. He hadn’t tweeted in a year. His LinkedIn profile was scarce and out of date. After losing his job, he spent countless hours on his portfolio (which he had also neglected while working). He went to industry events to build a network. Most people at the events didn’t know him. When talking with hiring managers at these events, he had to work hard to sell himself, hoping they’d interview him after applying for roles at their companies. Luckily, the designer finally got a new job five months later. But he wasn’t thrilled with his new job. After months of searching, he took the first offer he received so he could pay his bills. He didn’t have the luxury of being choosy. This designer fell into a trap many designers fall into. He waited until he was unemployed to work on his design presence. Instead, he could’ve prepared by investing in his UX brand long before he lost his job. Your UX brand is a simple concept: It’s how others in the field perceive you as a design professional. Your brand is a combination of your skills, your work experience, and your overall professional reputation. You don’t have to speak at conferences or write books to have a professional brand. We all have a professional brand, whether we realize it or not. The beauty of having a brand is that you can intentionally design it to portray yourself as the designer you want to be. You can build your UX brand now to lay the groundwork for future opportunities. Building your UX brand doesn’t have to be a massive project. You can do small things, regularly, over a period of time, to establish your presence as a designer. I recommend you put a small amount of effort into your brand now, even if you’re happy at your job. Building your brand can do more than prepare you for your next job search. As I explain below, a strong UX brand will help you connect with other design professionals and even sharpen the skills you use at your current job. To start building your brand, I recommend writing a story about what you want to happen if you get laid off from your current job. Write the story around the best possible scenario, where you land an awesome UX job after you’re let go. Think of your UX dream job. If your dream job came around, what would it look like? What type of work would you do? What type of team would you work with? I went through this exercise recently. I decided if I had to leave Center Centre, the UX design school where I’m a faculty member, I’d like to work in-house at a company that’s building and training a UX team. Six months from now, I lose my job at Center Centre. I announce on Twitter, LinkedIn, Facebook, and various other channels that I’m no longer at Center Centre. Within days, a dozen of my industry contacts message me privately. They ask if I would consider working with them. One person’s message really piques my interest. They have a large team of UX designers who are junior and mid-level. Those designers need a lot of training. Sending them to conferences and workshops isn’t enough. They need a senior person in-house who can do the UX work and train other designers to improve their skills. Then, that person asks me to apply for the role. You might be wondering why I wrote this story about my dream job. I think it’s important to write the story about the job you’d love to get and not about any random UX job. There’s no guarantee that building your UX brand will get you a dream job. There’s no guarantee your dream job will ever exist. And that’s fine. The point is to be intentional about how you position yourself as a designer, so you can get a UX job you want in the future. Ask Yourself, How Do I Want the Design Field to Perceive Me? After writing your story, the next step is to ask yourself a few questions about how you’d like other professionals to perceive you as a UX designer. What do I want people in the industry to think when they hear my name? What skills or experience do I want to be known for? If I want to be a specialist in UX design, what specialty do I want to be known for? Then, write down the answers. I’m an expert in helping other people learn UX. I’m an educator and a skilled designer who can go back to the industry and get to work from day one. I can mentor team members and help them learn a wide array of UX skills. I’m a highly skilled UX generalist who has an enviable knowledge of the landscape of UX design. I have high professional standards and will model professional behavior for the next UX team I join. After answering those questions, craft a plan of action. The plan includes things you can do to be perceived as you want to be seen in the industry. That perception will likely get you closer to your dream job—or at the very least, the type of UX job you want. Below are some approaches you can put into the plan. You certainly don’t have to do all of these things. I recommend choosing a few that work for you. Share resources that interest you. Discuss topics you find interesting or applicable to your work. I schedule time on my calendar each week to read articles that interest me. Then, I share the best articles on Twitter. Make sure you have an active online presence. You’ll want potential employers to see relevant, up-to-date information about you when they search for you. You can create profiles on whatever services you think are best for you and your goals. Some examples include a Twitter profile, a LinkedIn profile, and an Instagram account. If you don’t own your digital presence, hiring managers may find very little information when they search for you. Or, they’ll see accounts for people who have the same name as you—and possibly confuse you with those people. After creating accounts, keep your digital presence somewhat active. Even if you tweet once a week, that’s better than once a month or not at all. I laughed and thanked her. She found results for me instead of another Jessica Ivins because I maintain my online presence. I keep it active on design-related websites that are scannable by search engines. If you Google me, you’ll likely see results for my website, my bio on my employer’s website, my Medium account, my Twitter account, my LinkedIn account, and so on. Blog about what interests you. Write about the design work you enjoy doing, even if you can’t do that work at your job. You can blog on your personal site or on a writing platform like Medium. You could also submit your ideas to a UX publication. Speak at meetups or conferences. You can start small by volunteering to present at your local UX organization. You could even start by joining a panel discussion. It’s usually easier and less time-consuming to prepare for a panel than for a solo presentation. One of the best ways to gain in-depth knowledge of something is to teach it to someone else. Consider teaching a workshop or a class on what you enjoy doing. Teaching a topic also positions you as an expert on that topic. You don’t have to speak at conferences or write books to build your brand. You can do some of the simpler things on the list above. You can even brainstorm your own approaches. The point is to get yourself out there in a manageable way. I read multiple UX articles a week, and I tweet the best of what I find. If I find an article useful, I highlight interesting parts. Then, I craft tweets about those articles, and I schedule the tweets to publish later. I share an interesting UX resource on LinkedIn. I edit one of the tweets to make it more appropriate for LinkedIn. Then, I share it. I review the LinkedIn feed to see what my contacts are doing and contact one person. I ask them how they’re doing or congratulate them on an achievement they shared in the feed. By staying in touch with them, I keep my professional relationships with them warm. I check the Twitter feed multiple times per week and respond to any interesting conversations about design. I hang out in various other online UX communities as well. I contribute to discussions about learning UX design and growing your UX career. I attend local and regional design events. I don’t do this every week. I do it about twice a month. When attending events, I talk with professionals I already know. I also set goals to meet at least one new person at each event and establish a relationship with them. After I meet the new person, I usually send them a request to connect on LinkedIn. I read several design books and several business books each year and post reviews online. I often leave reviews on Goodreads or Amazon. I write and publish blog posts like the one you’re reading now. I write about topics I’m interested in that position me to be an expert in UX design, UX education, and UX career growth. I occasionally give presentations or workshops about UX. I only do this a few times a year because it takes so much time to prepare a high-quality presentation. Most of the topics I speak about are related to learning UX design or about growing your career. You don’t need to do everything I do. As you can see, my plan is very long. Luckily, I have enough time in my schedule to tackle this list during most weeks. I don’t have family obligations, major health issues, or any other limitations that keep me from doing these things. If you do a fraction of what I do, that’s probably enough. Again, craft a plan that works for you and your situation. It’s also worth noting there is no such thing as a perfect plan or a perfect UX brand. Despite all the effort I put into my brand, there are things I can work on to make it stronger. In the meantime, I do my best, and I take it one step at a time. Investing in your UX brand can bring you many benefits. The investment won’t just help you get a job when you’re ready to find one. It will increase your chances of getting the UX job you want. In the meantime, by building your brand, you’ll strengthen relationships with other design professionals, and you’ll broaden your knowledge about the topics you share. So why not take the first step today? You’ll be thankful you established your brand when you’re ready to find a new job. Thanks to Bob Ricca for his input on this article.